Where's Our Octopath Traveler Review? Octopath Traveler releases tomorrow on Switch, and reviews are hitting now. However, the final verdict from Game Informer isn’t ready yet. It’s a long adventure; I’m 50 hours in, but I want to make sure I finish the story and see all of the tales conclude before finalizing a score. So look for our full review sometime next week! Setting aside the mystery of the overall narrative payoff, I can say that my general impressions of the rest of the game are positive so far. The structure is novel, the visuals are fantastic, and the combat system is clever. I especially love the depth and strategy of battle, particularly in the numerous boss fights. 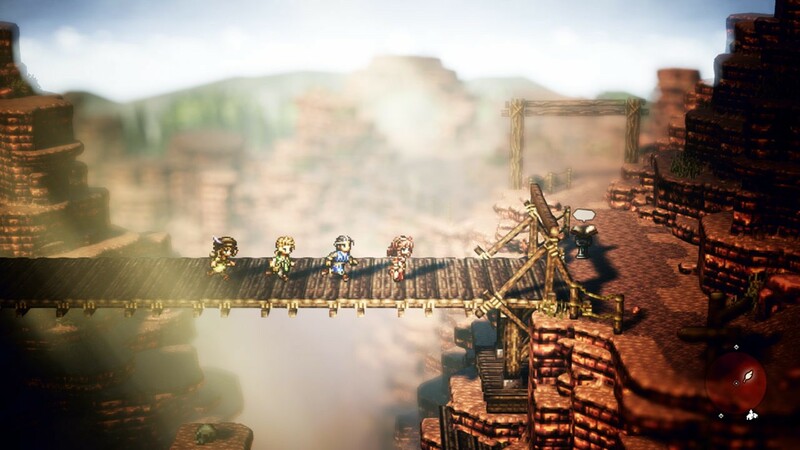 If you’re already interested in Octopath Traveler and think you will like it (especially after playing the demos), you are probably right. However, the focus on eight individual stories is a double-edged sword. It gives specific characters time in the spotlight, but also limits the sense of camaraderie and cooperation among the heroes. I’ve also hit some pacing issues, where boring grinding is required to hit the level threshold for the next wave of story content. I know that most JRPG fans expect a degree of this, but that doesn’t make it fun. Those are just the broad strokes of my Octopath Traveler experience for now, and my opinion may even shift between now and when the review is finished. In the meantime, you can read our in-depth feature on the game, or watch us play the first demo.